Very few foods hold such a strong sentimental value for me as chocolate tapioca pudding does. I was first introduced to the kind in the Whole Foods prepared foods section by my not-so-baby sister (Hi Al!) about 5 years ago, and it quickly became one of my favorite snacks. Soon after that, I started working at a really intense, all-consuming, stressful job. My friends there were my lifeline, and our almost-daily lunch trips to Whole Foods in Glendale, California were often the highlight of my day. Obviously those trips included chocolate tapioca pudding, and if my memory serves me correctly, I converted at least one skeptic (Hi Erin!) into a chocolate tapioca lover. Ever since we moved to a smaller town with no Whole Foods, there's been a gaping hole in my heart where my beloved pudding used to be. 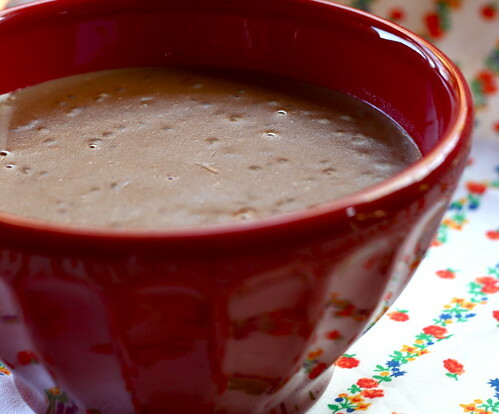 When I saw that my Adopt-a-Blogger mentor, Jenn, had a recipe for chocolate tapioca pudding, I added it to my foodie to-do list right away. I made it today, in part, to thank her for being an awesome new internet friend. She so graciously helps me with inane questions and also encouraged me to submit my photographs to Tastespotting for the first time a while back. It was always a far-off dream of mine to have a picture accepted there, and since then I've had 5 photos featured on the site! As I tend to do, I made a few changes to Jenn's recipe. The biggest change was using white chocolate chips. The result was perfect-- not too chocolatey, not too sweet. A perfect imitation of the Whole Foods pudding I've been coveting. 1. Mix everything except the vanilla or liquor together in a pot over medium heat. Stir constantly until mixture comes to a full boil – i.e. still boiling even while you are stirring. 2. Take off heat, add vanilla or liquor and stir. Let stand 5-10 minutes. Serve hot or bring to room temperature, refrigerate, and serve cold. I never tried chocolate pudding with white chocolate chips but it sounds delicious! I also love your photo of double chocolate raspberry layer cake, featured on tastespotting, looks mouthwatering!! You can also find great chocolate recipes on www.dovechocolatediscoveries.com for you to try. Gosh I love this recipe! It really must be like comfort in a bowl! I've never had tapioca pudding, but I'm researching recipes for a friend's birthday (she wants this instead of cake!) and I think yours just went to the top of my list!